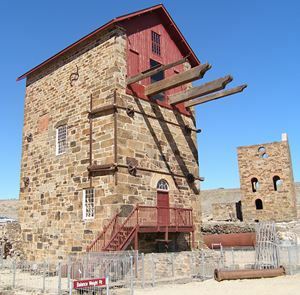 South Australia possesses some of the most intact remains of historic copper mines in Australia. Less than 10 years after the foundation of the colony in 1836, the economy of South Australia was rescued by the discovery and mining of copper at Kapunda in 1842, at Burra (The Monster Mine) in 1845, then at Wallaroo in 1859 and Moonta in 1861. Wallaroo, Moonta and Kadina now form what is known as the Cornish or Copper Triangle. The Cornish have left strong evidence of their work and lives, with Cornish engine houses, non-confirming chapels and stone built houses in the towns and landscape. People like Henry Ayers made their fortunes out of the Monster Mine. He had arrived in SA in 1840, served as secretary of the South Australian Mining Association from 1845 until his death in 1897 and was elected premier of the state on several occasions. Ayers House, Adelaide, is open to the public (NT). The Bon Accord Mine at Burra has strong associations with the copper mine at Cadia, NSW, as do the mines at Kapunda. 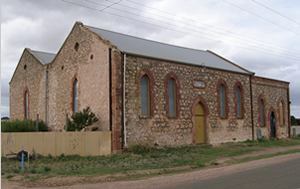 The core group of Cornishmen, who founded the community at Cadia, had mostly come from Kapunda and Burra. The Bon Accord Hotel at Cadia, NSW, was excavated by Ted Higginbotham in 2000, as part of the investigation of Cadia Mining Village. is one of the best preserved in Australia. the same type of buildings for worship.